Porter Dodson has moved to new offices in Yeovil, located at Telford House, The Park, which is in a prominent position overlooking the Hospital Roundabout while still being in the town centre. The refurbishment of the old telephone exchange has provided modern purpose built facilities and extra parking (available at the rear - access off Clarence Street). The move will enable us to work more collaboratively, sharing experience and knowledge for the benefit of our clients. After all, we're all about you. Robert Fox, Managing Partner, said: “We want to stay at the heart of the communities in which we work and live and these new premises enable us to do just that in Yeovil while also helping us to meet our big ambitions. We continue to drive success by putting our clients first and this is borne out by the results we get. 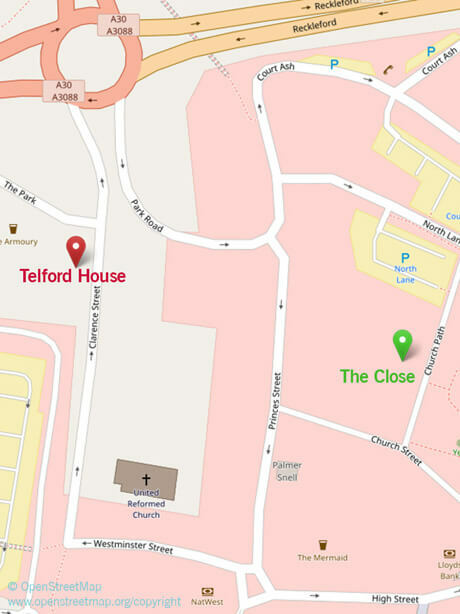 The Firm still occupies the offices and parking at The Close, overlooking the Churchyard, where the Children team are based.